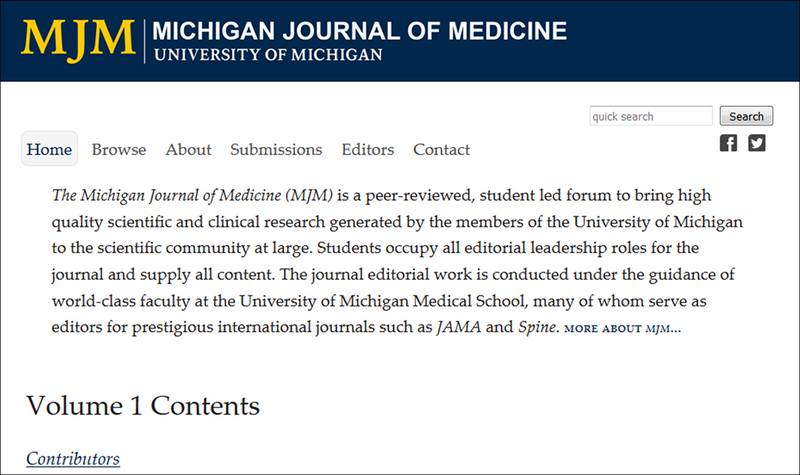 The U-M Medical School recently launched the Michigan Journal of Medicine, or MJM, a student-led, open access journal. MJM is being published by Michigan Publishing Services, part of the University Library, in collaboration with Medical School Information Services, or MSIS. As a recognized leader in medical education and biomedical research, the Medical School is committed to preparing physician scientists for leadership roles at the bedside as well as at the bench. While there are many programs that encourage students to conduct research, until now, there has been no established program that trains students to effectively evaluate and communicate the results of this research. MJM was developed to help fill this need, and it is now an integral part of the Medical Writing and Editing course for fourth-year medical students. Medical students take part in the yearlong, credit-based class where they learn and experience all aspects of medical journal publishing, from contracts and copyright to peer review to checking proofs. Students supply all of the journal content and, with guidance from faculty, assume all editorial leadership roles including managing peer review and making final publication decisions. The journal’s first editor-in-chief, Shannon Cramm, and her editorial team developed the workflow needed to manage manuscript submissions, handle peer review and make publishing decisions for the first publication. MJM was set up for success and longevity. While other institutions have attempted to launch student-run journals, the publications tend to stagnate as students graduate and succession plans are not established. As MJM was developed, it was clear that the journal needed to survive and thrive beyond the first group of student editors. With strong faculty and staff support, an active and committed library publishing partner and an essential role within the new Medical School curriculum, the journal will continue to grow. MJM is partially funded by a grant from the University of Michigan’s Third Century Initiative.